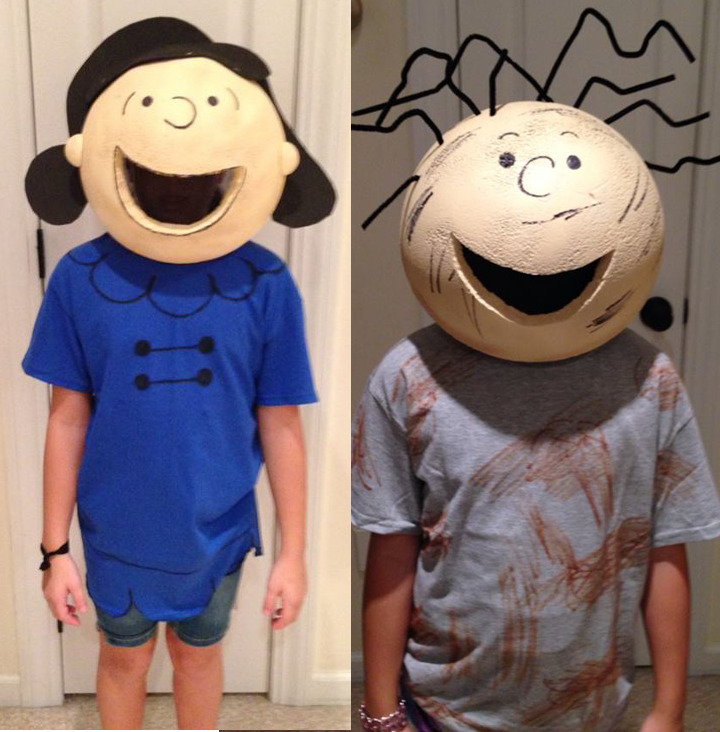 Making the Peanuts costumes for our school Halloween skit, I first tried to make the head out of paper mache but the punching balloons kept breaking and it was a messy disaster. So to Home Depot and craft stores I went to see what I could find. After walking around placing items on my head to see if they would work, I finally found these 12″ smooth foam half hollowed out Styrofoam balls at Michaels Craft store. I took them home, printed out photos of what the characters looked like and the fun began. First I cut out a mouth on each of the Styrofoam balls. This is what the kids actually looked through to see. Then, I spray painted them in a flesh color. They dried rather quickly in 15-20 minutes. Next, I drew on the face with a black sharpie marker. I took small round Styrofoam balls, cut them in half and spray painted them the same color. I attached them onto the heads with toothpicks to make the ears. The mouths were made from a roll of replacement mesh for screen doors/windows that I picked up at ACE hardware. I then used a staple gun, with extra long staples and stapled it inside the heads. This way the kids could see out and others couldn’t see in to see their faces. I added different types of material to make the hair. 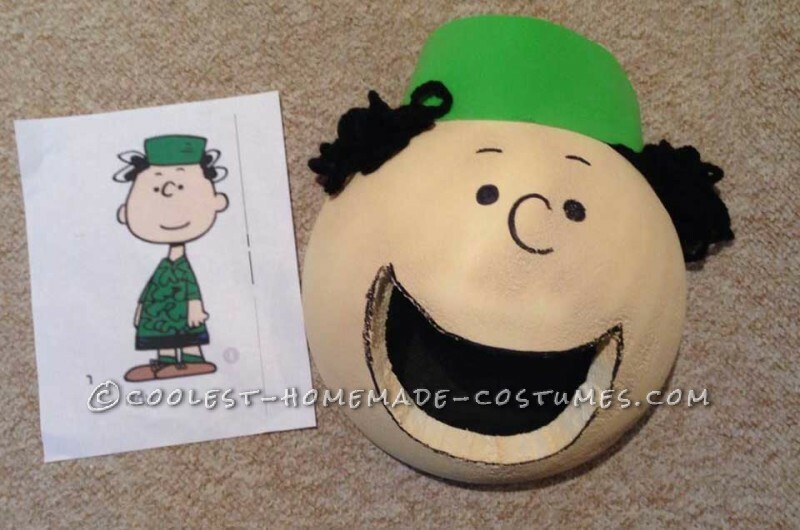 For Charlie Brown, Pig Pen, Linus, Shermy, Roy and Rerun it was black pipe cleaners inserted into the heads. 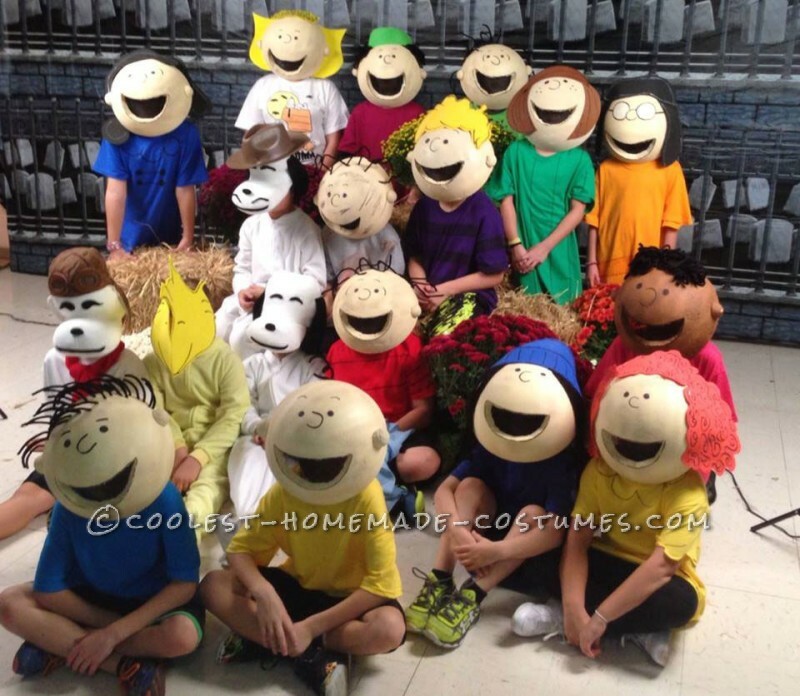 For, Lucy, Sally, Peppermint Patty, Marcie, Schroeder and Frieda (girl with naturally curly hair) it was foam sheets that I drew on with a black Sharpie to make the curls. I used a staple gun to adhere them to the heads. 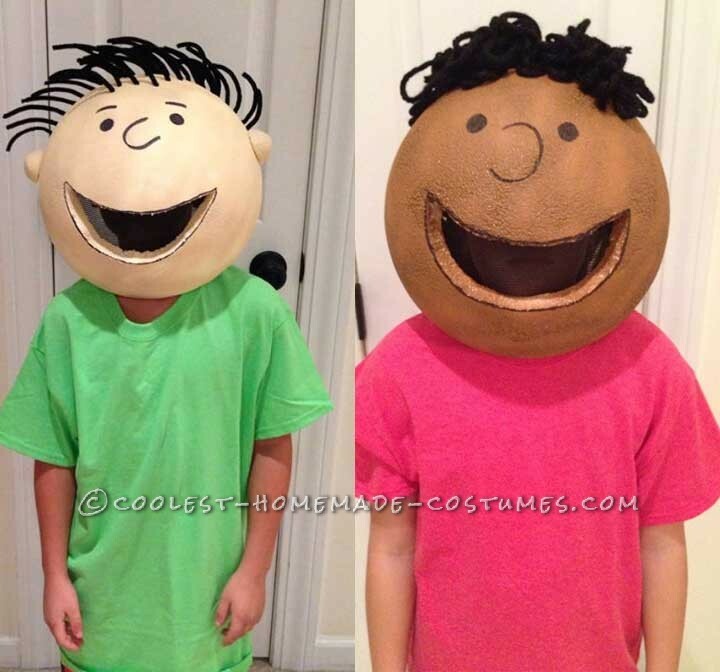 The boy with long hair and Franklin’s hair were made out of yarn stapled to the foam head and the hat was made out of a foam sheet. I then stapled heavy string (tie ends in knots so they don’t come loose) to each side of the head. 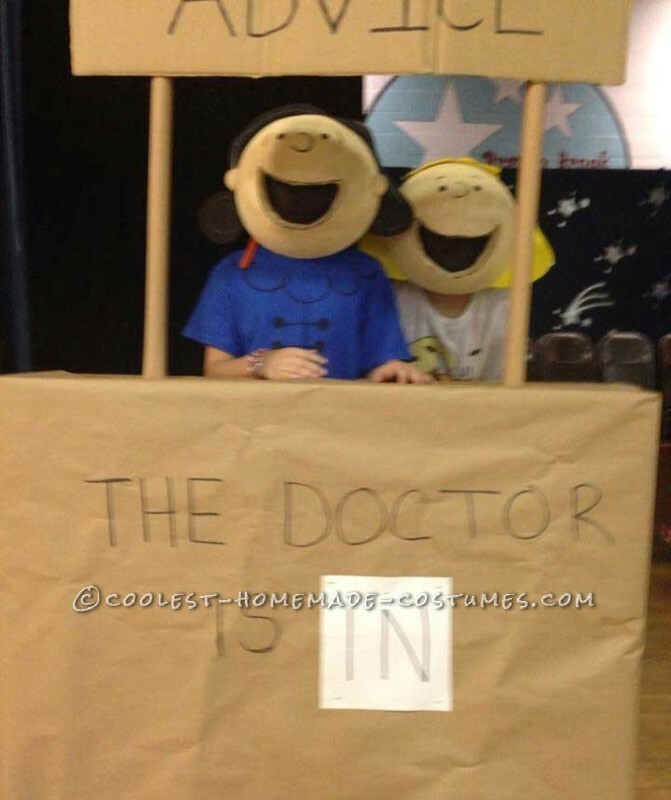 It can be tied around kids’ head to keep in place. As for Woodstock, I just cut out two yellow foam sheets the same pattern and stapled them together, drew on the design and then stapled a foam hat underneath so it could be worn. For Snoopy, Spike and the Red Baron, I had someone sew white knit fabric to and around baseball hats and then it was stuffed with stuffing. 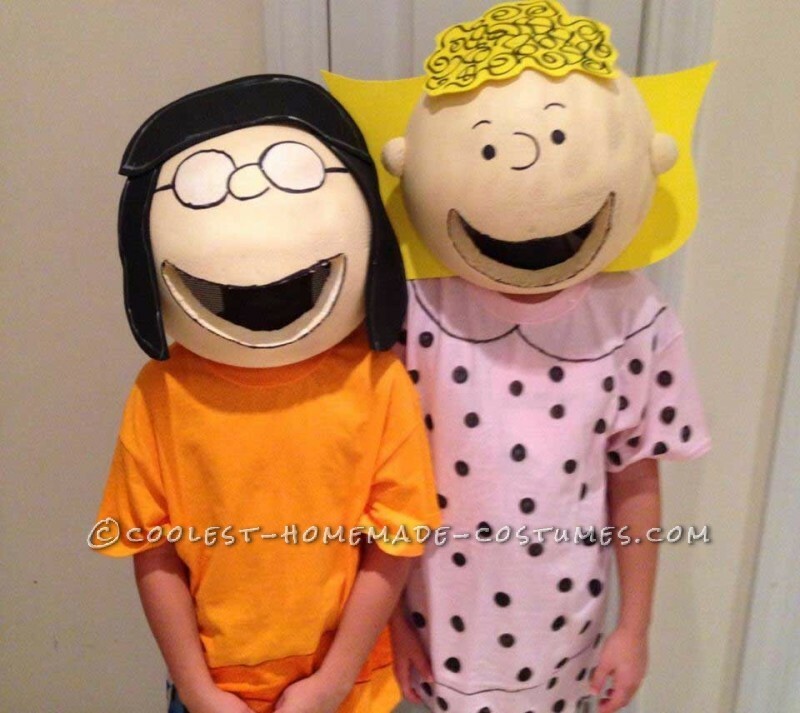 Their faces were made with black felt shapes that were hot glued on. Spike’s hat was a foam one I found at AC Moore. 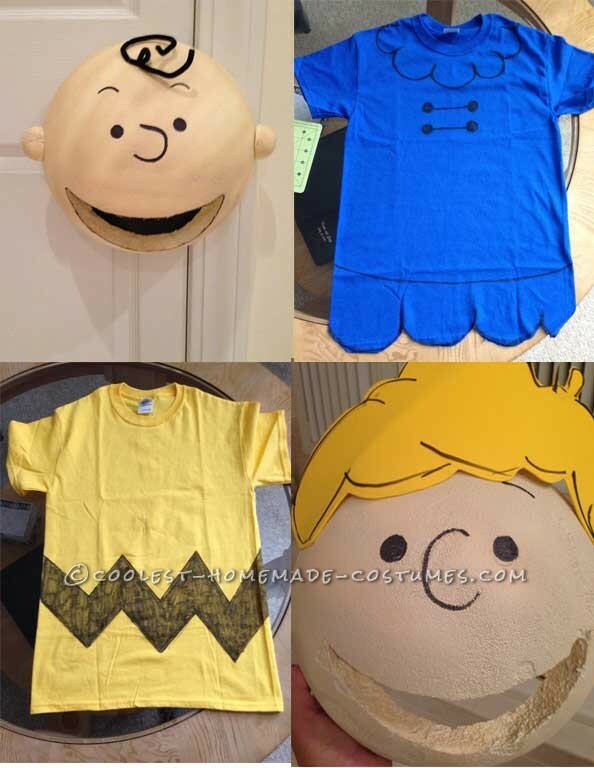 All the costumes were t-Shirts I bought at AC Moore in small adult sizes that I cut and drew on with fabric markers like the cartoon characters. 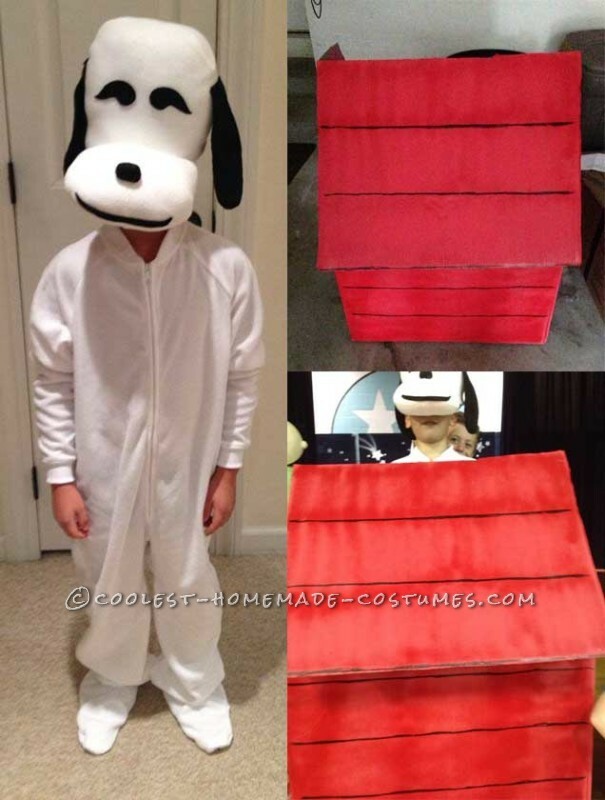 I then made Snoopy’s doghouse and Lucy’s advice desk out of cardboard to use as props. Ta da! 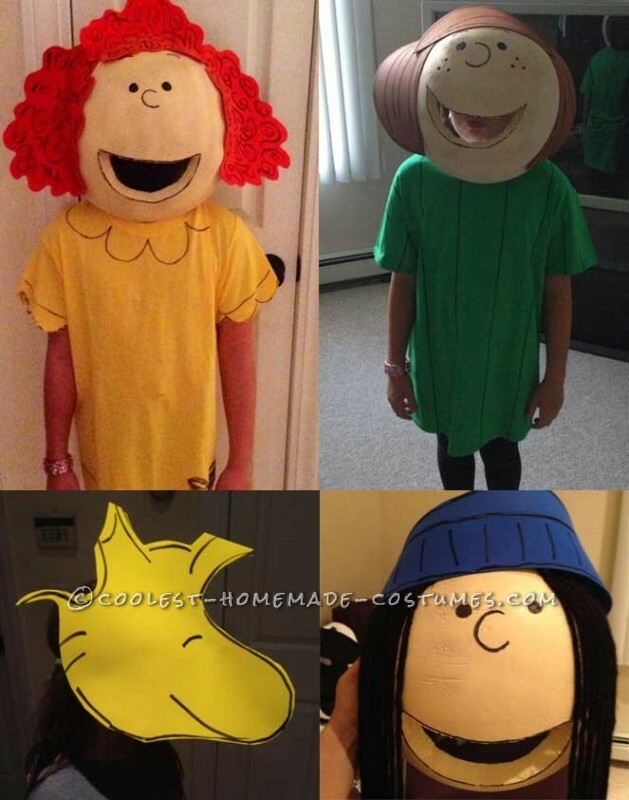 The Peanuts Gang was complete.